Galagos, also known as bushbabies or nagapies (meaning "little night monkeys" in Afrikaans), are small, nocturnal primates native to continental Africa. There are 21 species, and they form the family Galagidae. Range varies with species but includes most of the forested and bush regions of Africa south of the Sahara including some of the nearby islands such as Zanzibar. Their range does not extend to Madagascar. They are quite successful. 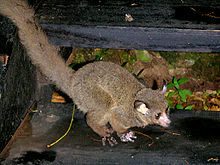 In both variety and abundance, the bush babies are the most successful prosimian primates in Africa. Galagos are all arboreal and known for their ability to leap great distances between branches. Galagos are omnivorous but primarily insectivorous. Their favorite food is grasshoppers, but they also eat small birds, eggs, fruits, seeds and flowers. Euoticus has specialized front teeth for removing tree bark so it can feed on tree gum. ↑ "Bushbaby. African Wildlife Foundation". Retrieved 2012-07-26. This page was last changed on 10 September 2015, at 04:29.